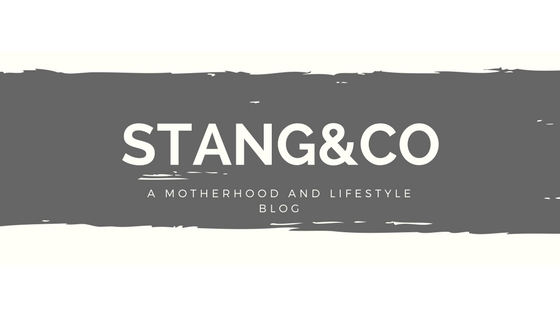 It has once again been a hot minute since I have shared a blog post. That seems to be the way I start them all the past year. Woops! 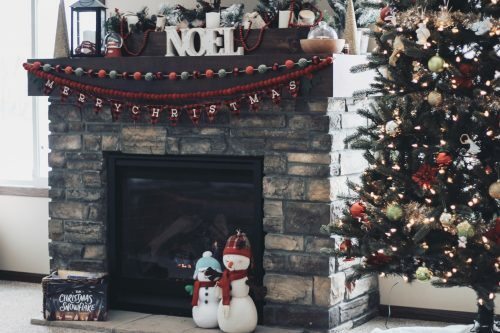 But, I have so many new holiday items this year, and I figured why not jump back in with a holiday home tour! 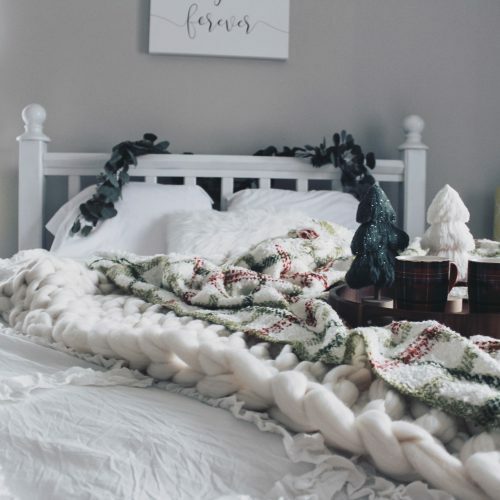 I tend to keep our simple holiday decor to the main areas of our house, but I did add some touches to our master bedroom this year! 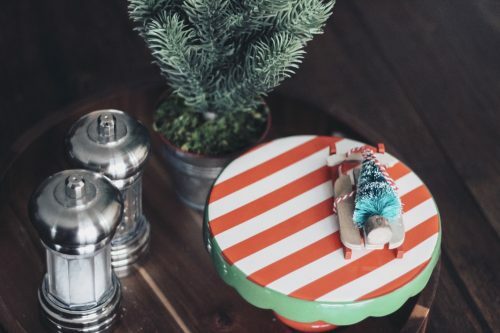 I am also sharing a few tips and tricks to decorate for the holidays without letting it get too overwhelming. 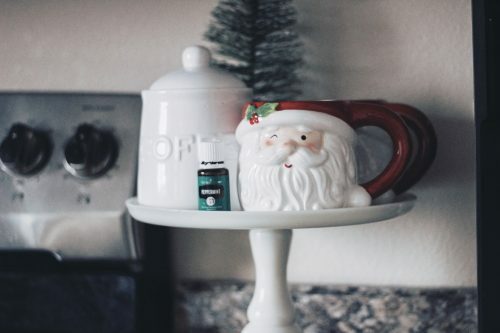 Simple holiday decor is easy to do, and saves you sanity, too 🙂 So grab a cup of coffee and enjoy! I linked up the items I could find that are new/in stock, but feel free to leave a comment if I missed anything you are curious about! 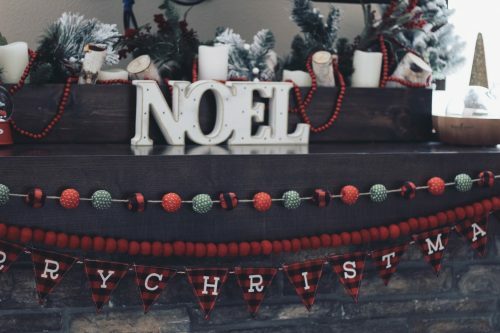 This red felt ball garland is my favorite find this year. I don’t know why, but I am just in love with felt garlands and can never have too many! This one is plenty long, and fills in our mantle perfectly! Since getting our hall tree bench this summer, I have been having SO much fun decorating it and I couldn’t wait to finally add some Christmas cheer to our entryway this year. This eucalyptus garland has been a huge hit this year it seems. I accented with some galvenized houses I picked up and the cutest little trees. I can’t find them online, but they are in the Target Wondershop! The mistletoe banner was a clearance find last year (I think I got it for $1.75!) but if you are really a fan, I did find it on eBay. Of course it is listed at full price, but figured I would share just in case! I really enjoyed adding a few festive touches to our bedroom this year. 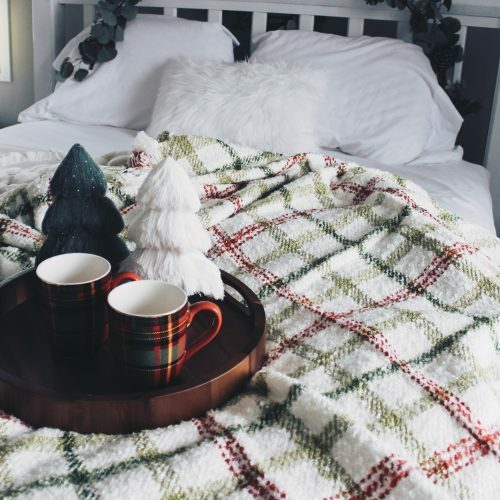 I have never decorated outside of the living spaces in our home, but I love feeling festive even when I’m going to bed! For the record, I do have small tinsel trees for the boys to have in their room. However, they like to pick them up and plug/unplug them so much, we had to take them away. Maybe one of these years they will leave them alone and we can set them up for good! This one seems simple enough, but I feel like it is worth mentioning. To fill an entire home is a challenge. 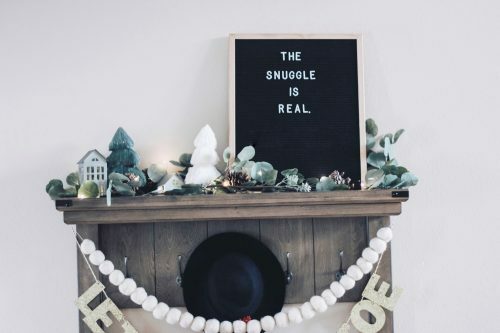 But making one room feel completely magical is totally doable! For example, I add little touches to our kitchen, but aside from a few bottle brush trees and festive mugs, I don’t go too overboard. 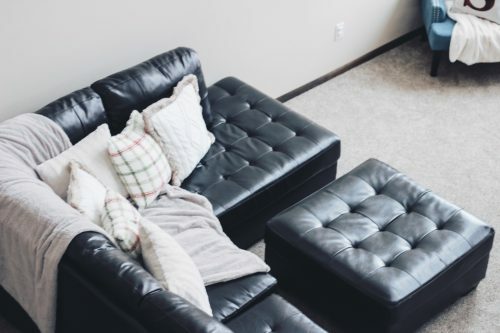 Our living room is the most used space in our home, so that is where the magic happens. 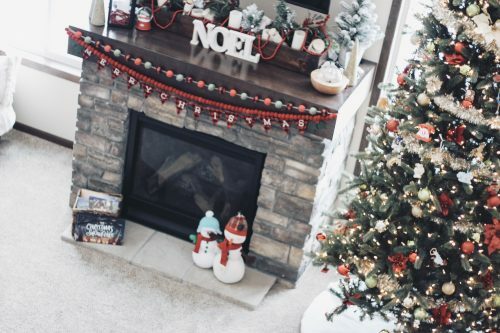 Aside from the tree, our mantle is the focal point of our living room, so that is where I invest the majority of our decorations. I try to be strategic and use spaces similarly throughout the year, which also makes decorating easier because I have a system I use! 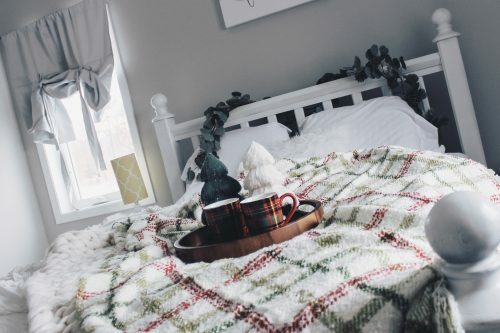 Our upstairs is void of any decorations, and maybe one year I will grab a few things to place there, but for now, I would much rather have one space feel like ALL OF THE MAGIC, and multiple spaces with tiny touches. I love cute little trees, snow globes, and decorative figurines, but I feel like you only need so many. Just about everyone, however, needs a blanket and pillows for the couch, and coffee mugs for the kitchen. Absolutely use these items to decorate! I always like swapping out these pieces throughout the seasons, anyway, so why not use them as a part of your decor! I have plaid coffee mugs, and while most of the year I leave them in the cupboard, during the holidays they look so pretty out on display! 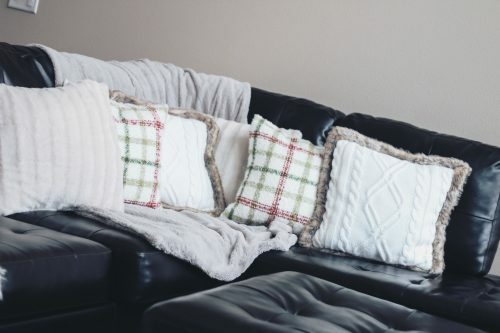 It is amazing how a festive blanket or some plaid pillows can immediately change the look and feel of a room, while still serving their functional purpose. 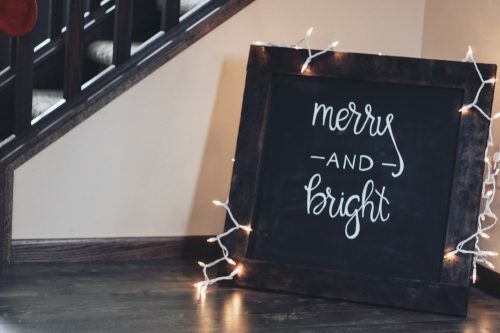 The best kind of simple holiday decor is the kind that is functional, too! Okay, sometimes this one is a challenge for me. 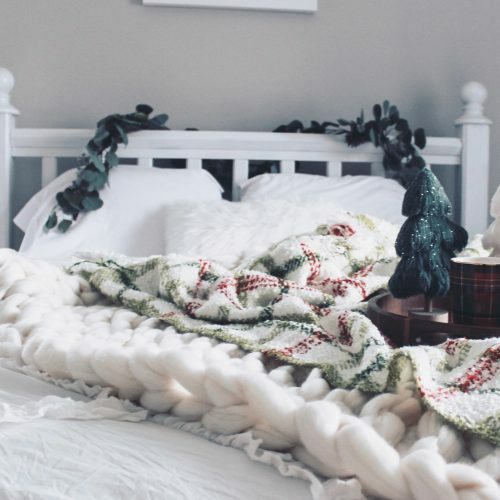 Having a theme ultimately helps me know what makes sense to buy when it comes to holiday decor. We have lots of reds and greens, and definitely a more rustic vibe going on. So, while all things white, sparkly, and glam speak to my glitter loving soul, those pieces probably wouldn’t blend in well. It can be so easy to see something in the store and be drawn to it. Those impulse buys are real, I know (especially for all of you newborn mamas who definitely online shop during those 2am feedings). Before making any holiday purchases, as yourself these simple and straightforward questions. Will this match the rest of my decor? Do I have a place for this? Will it add to my space, or just create clutter? 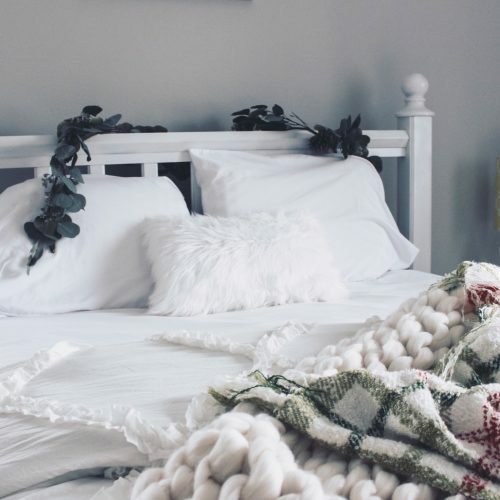 Again, I love a pretty piece of decor as much as anyone, but I am a firm believer in making strategic purchases, rather than buying and scrambling to find a place for an item that was purchased without much thought. 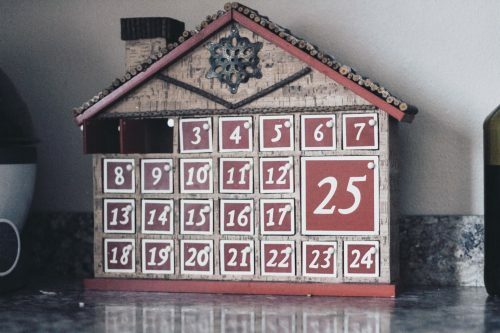 What kind of decorator are you during the holidays? 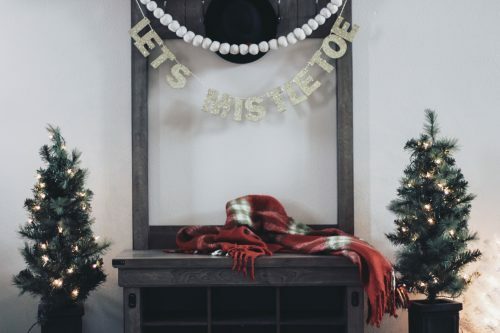 Do you go all out everywhere, or stick to simple holiday decor? I love seeing how unique everyone’s home is this time of year!